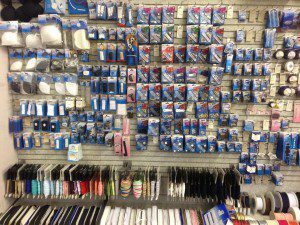 At Franklins we stock over 500 different Prym, John James, Clover and Hem-Line products in our haberdashery shop to help you make or even decorate your sewing project. We stock all leading manufacturers of threads, including Gutermann, Madeira, Robinson-Anton and Falc to meet any sewing requirement. 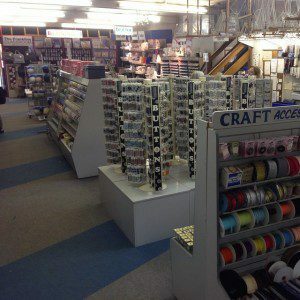 Find dressmaking thread, upholstery thread, decorative thread, machine embroidery thread and more. Plus, with over 3000 different buttons in store, you are sure find the right design to finish your sewing or knitted project. With our stores in Colchester and Salisbury each offering a 20 metre display of trimmings, our customers are certain to find the high quality materials they are looking for to personalise their garment. We stock a selection of upholstery trimmings, upholstery tags and pins for soft furnishings. Franklins employ knowledgeable dressmakers and experienced staff who can talk beginners and expert level dressmakers through any questions or queries they may have about our products.